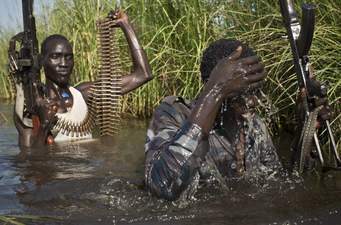 The South Sudanese Civil War is an ongoing civil war in South Sudan fought between government forces led by President Salva Kiir and the SPLM-IO (Sudan People’s Liberation Movement In Opposition). The conflict began in 2013 when Kiir dismissed his vice president Riek Machar from office after Machar openly expressed his intention to challenge Salva Kiir’s leadership. After his dismissal, Machar left the government to lead the SPLM-IO against Kiir, resulting in a bloody civil war that has cost the lives of an estimated 300,000 civilians over the past five years in a nation of 12.3 million people. South Sudan is not unfamiliar with violent wars. A region vastly differing from the rest of Sudan, South Sudan was always Christian and more aligned with Africa south of the Sahara while whereas Sudan which was overwhelmingly Muslim, identified with other Muslim nations of North Africa and the Middle East. This difference led to a push for independence from South Sudan and multiple civil wars. The most recent civil war ended in 2005 and led up to the referendum for independence in 2011 making South Sudan in 2018 the newest country in the world. Salva Kiir was chosen as the first President of South Sudan at the time of its independence while Machar was selected as vice president of the new nation. When Kiir began dismissing government officials including especially Machar supporters, and consolidating power, Machar in 2013 announced he would run in opposition to Kiir leading to his dismissal as vice president. Although the conflict is a struggle for power between two political leaders, it is also an ethnic struggle as the two major groups, the Dinka and the Nuer, longtime rivals, compete for power. Kiir is a member of the Dinka group while Machar is an ethnic Nuer. The SPLM army was primarily composed of Dinka troops and these troops have been accused of violent acts upon non-Dinka people and especially the Nuer. Some observers have claimed the Dinka troops have carried out pogroms and massacres of Nuer civilians. It is unclear how long this civil war will last, however there are over 7,500 UN troops in South Sudan whose objective is keeping the peace. So far, they have been unsuccessful. Negotiations are underway even as the fighting continues. There have been several truces between the warring parties such as the Compromise Peace Agreement signed in August 2015 that granted Machar the right to return to his position as vice president. His return, however, intensified fighting in and around Juba, the capital of South Sudan and led to his second ouster and replacement by Taban Deng Gai. The civil war is ongoing and likely to continue before conditions improve for South Sudan. “Starvation Threat Numbers Soar in South Sudan.” Al Jazeera, Nov. 25, 2016, https://www.aljazeera.com/news/2016/11/starvation-threat-numbers-soar-south-sudan-161125134045296.html; “Conflict between Dinka and Nuer in South Sudan | ECC Factbook.” ECC Library, Jan. 15, 2018, https://library.ecc-platform.org/conflicts/natural-ressource-conflict-south-sudan-dinka-vs-nuer; “South Sudan: What Is the Fighting about?” BBC News, May 10, 2014, https://www.bbc.com/news/world-africa-25427965.